Read the rest of our detailed Hostgator review to see if this is the right web host for you. 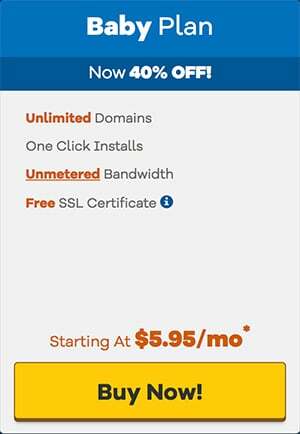 Hostgator have a special offer on Shared Hosting. Get the ultimate web hosting package for just $3 per month. This includes everything you’ll need to get online. Free domain name, web hosting and unlimited number of email addresses. My very first website was built using HostGator. I’m still filled with fond memories to this day. You’d be hard pressed to find a more rock solid and reliable host, especially when you’re just starting out online. Regarding speed, HostGator cloud hosting continuously comes out on top, with a lightning-fast speed of ~280 ms. Beyond loading speeds, it’s an incredible host for those who want to build WordPress websites and blogs. Overall, HostGator is a very versatile host that caters to a wide variety of website owners. Below, in our detailed HostGator review we cover every possible detail of HostGator’s various hosting plans, so you can decide if it’s the right host for your website. Creating a website and getting it live on the internet is easier than ever. Still, the common misconception that you need to be a web designer or website developer pervades. In some cases this is true. For instance, you want to fully design every element of your website from the ground up. However, by choosing the right hosting provider, you can greatly streamline this process. From, website builders that’ll help you quickly build your site, to one-click installs of popular CMS like WordPress. But, far from just helping to streamline the process of getting your site online the right web host will help to ensure your site stays secure, loads quickly, and a lot more. The host you end up using can make or break your success online. For example, with a low-quality host your site will have slower loading speeds, dealing with support will be a headache, plus you’ll have low levels of reliability, and be more susceptible to hacking. If you’re a beginner, meaning this is your first website, then you’ll want to go with a host who understands what it’s like to build your very first website. Although Hostgator offers a ton of different types of hosting, they truly place a focus on beginners who are early on in their online journeys. 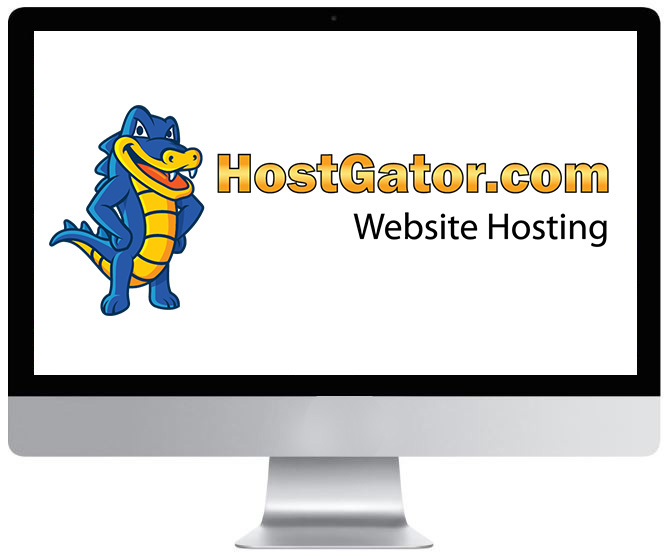 HostGator is a web host that works with you to achieve your website goals, not against you. HostGator has humble roots. It was founded by Brent Oxley, a student at Florida Atlantic University, back in 2002. It’s achieved growth year after year, ever since it started. In 2012 HostGator was acquired by Endurance International Group, who also runs hosting companies like Bluehost. It’s official office is in Houston, Texas, but it now has offices all over the world. It serves a very large portion of the market ranging from total beginners to website veterans, and currently hosts over 9 million websites. HostGator has sustained high levels of growth since its inception. Which means they’re doing something right. Typically, you’ll have one to two hosts that break out every year, only to fade back into obscurity just as fast as they came onto the scene. But, not HostGator, they’ve remained one of the most popular hosts out there since their inception. The ability to remain that competitive and popular over the long-term really says something about the quality of service they provide. HostGator has a lot going for it. It’s one of the most popular hosts in the world for a reason. HostGator is fast, even on the basic shared hosting plans. They regularly score in the top of hosting performance for beginner web hosts. Of course, a lot of your website’s speed will also depend on if you’re following website speed best practices. But to get the most out of your site, you’ll need a host that provides a high performance foundation to build from. If you’re a first time HostGator user then you can pick up a hosting package for very cheap. We’re talking less than a cup of coffee. Now, the overall price of hosting will go up in time, but hopefully, your site will be profitable by then and the increase won’t even make a dent. HostGator provides 24/7 customer support over the telephone and online chat. While the telephonic support representative provides you with detailed instructions related to any issue almost instantly, the online chat support is rather slow. However, their tech support knows what they are talking about and are quite knowledgeable. They also offer a ticketing system for customer support. On top of that, video tutorials, support forums, and other support mediums are also available. HostGator offers a ton of different support channels. For example, you’ll get access to 24/7/365 support through live chat, email, phone, and even via social media. The response times might not be super fast, but they’ll always go the extra mile to help resolve any issues you might be experiencing. Right out of the gate HostGator offers 99.9% uptime. This is pretty standard across the board for most hosting companies. But, it’s still something you’ll want your host to have. Any time that your site spends offline, your losing revenue, and delivering a poor user experience. Beyond just having solid uptime, they back it up with a guarantee. If your site’s uptime falls short of their 99.9% uptime, then you’ll get compensated accordingly. Another really great feature of their hosting plans are their unlimited nature. This means you get access to things like unlimited disk space, unmetered bandwidth, and unlimited databases. On top of that, you can also create an unlimited number of email addresses and domain names on your account (as long as you aren’t using the most basic shared hosting package). A lot of hosts offer unlimited packages as well, and typically this is more of a phrase than it being completely unlimited. Essentially, there will be limits on your account. Even with HostGator. However, let’s say you’re on a shared hosting package and you’re using it run one or two sites. The chances are very slim you’re going to run into any resource issues. As you can see it’ll actually take a lot of work in order to run into those limits. The only one you might bump into is the server CPU usage. If you’re experiencing a massive volume of traffic, then this could potentially be an issue. Although HostGator offers pretty fast speeds and reliable uptime there are reports of loading speeds varying. Sometimes you’ll notice that your site loads very fast, while other times you might see a lag. There’s a variety of reasons this could occur. But, some of the most common is due to other sites on the same shared server using too many site resources. Or, your site is experiencing a surge in traffic volume, and as a result, it’s loading slowly. It could even be due to issues on your own site, such as not optimizing your images, or website the right way. A lot of the hosting plans on HostGator’s site offer free backups as part of their feature set. However, these backups aren’t incredibly useful. If you want to backup your site you’ll have to do these backups yourself from your cPanel account. If you want truly automated backups, then you’ll need to pay extra. These automated backups also have their limitations and only one week of backups will be kept at a time. So, if you want to restore your site from a version older than that then you’re out of luck. If you’re serious about backing up your site, then you’ll want to use a third-party backup service. HostGator has a rock-solid and helpful support team. But, sometimes the wait times can get a little long. This is especially true with live chat. Sometimes the response time will be right away, while other times you might have to wait a few minutes. This isn’t an absolute dealbreaker, but it can be frustrating if you’re experiencing an issue with your site that you need resolved right away. This also isn’t particular to HostGator but instead seems to be common practice across the industry. When you first sign up for a hosting package the rates are incredibly low. Plus, the longer you sign up for hosting initially the cheaper these rates will be across the board. But, over time, usually when your first term is over, then these rates will jump up. This is called “promotional pricing”. Usually, only your first term will be at the low advertised rate, while when the time comes to renew you’ll notice your renewal rate will be higher. 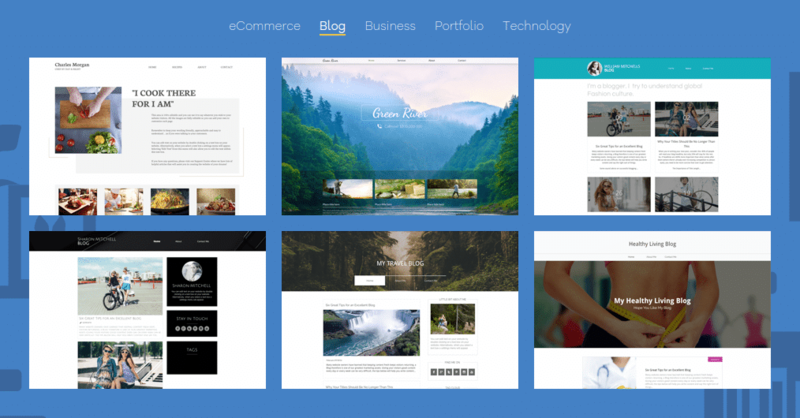 The free website builder is a pretty cool tool, but if you’re doing more than creating a simple couple page website, then you’ll run into the limits pretty quickly. The only way to build a large and feature-rich site is to upgrade to one of the paid plans. When you tack this price on top of your hosting price, then you might be spending more than you want per month, just to have your site online. However, you should also consider using WordPress to build your site. You can do this on a budget and build a powerful and feature-rich site. HostGator offers a wide variety of hosting plans that suit almost every kind of website owner. From those just getting started online, to site owners who run established, high-traffic websites. When browsing through the different hosting options and plans available you’ll find all the information you need to make the right decision. You’ll find a variety of different hosting options to choose from including, shared hosting, VPS hosting, cloud hosting, dedicated server hosting, WordPress cloud hosting, and even reseller hosting. No matter your budget or website needs you’ll be able to find the right hosting plan for you. For most people, shared hosting will be the best type of hosting for your needs. Most website owners will be completely satisfied with a basic shared hosting plan. It’s the most common starting point for any website owners who are just getting started online. There are currently three different shared hosting plans, all of which offer introductory rates that are incredibly cheap. If you’ve never built a website before and you’re looking for the most affordable hosting package, then this is the one you’ll want to get. This plan is equipped with single domain name support, a shared SSL certificate (for improved site security), unmetered website bandwidth, one-click-install support, along with a handful of other useful features. $2.75 a month for a 3-year subscription. As with other hosting plans the longer you pay for hosting up-front the cheaper your monthly rate will be. The Baby plan is a solid step up from the Hatchling plan. This is one of the most popular hosting plans they offer for one big reason. There’s support for unlimited domains. So, if you want to start another website you can simply add it through your control panel. This offers you much more flexibility and freedom. You’ll also get access to all of the features covered in the Hatchling plan. Scaling up to the next level, the Baby plan comes with support for unlimited domain names, ftp accounts and a shared SSL certificate. $5.95 a month for a 3-year subscription. 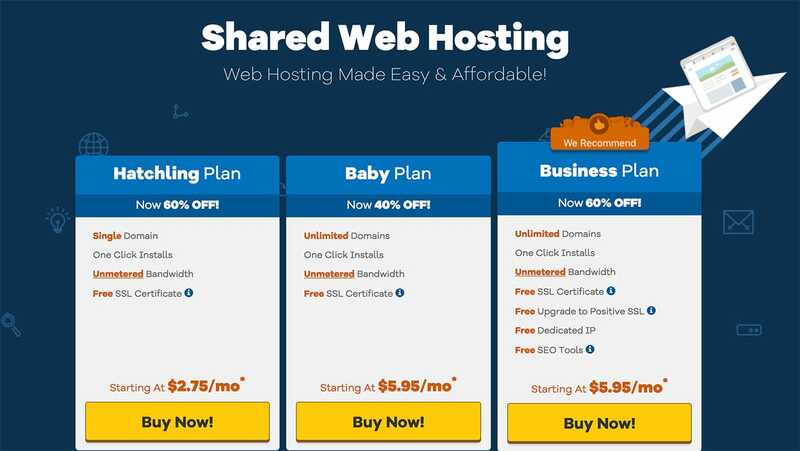 The final shared hosting plan offered is the Business Plan. This plan is perfect for small to medium sized businesses who are serious about their online business. It’s packed with features that’ll help to elevate your website security, along with improving your search engine rankings. You’ll get access to a private SSL certificate, ftp accounts, a dedicated IP address, a toll-free business phone number, along with bundled SEO tools. The Cloud hosting plans offered by HostGator are only a bit more expensive than the shared hosting plans. This makes a higher level of hosting readily accessible to a variety of website owners. Right out of the gate, cloud hosting also provides you with a ton of additional benefits. Most site owners won’t require this level of hosting and will be better off with a basic shared hosting plan. However, if your site is growing quickly, or you have scaling traffic needs, then cloud hosting is worth considering. The way that cloud hosting works you’re not restricted by the limitations of a single physical server. Instead, you’re relying on a network of connected servers known as a server cluster. This makes it incredibly easy to scale your resource usage up or down. So, if your site is growing very quickly, or you have unpredictable traffic months, then cloud hosting can help you effectively meet these needs. Plus, you have the benefit of nearly perfect uptime. If there’s ever a hardware issue with any server, it’s really easy to switch your site to another server on the network. The cloud hosting plans give you everything from the shared hosting plans and some. Cloud hosting will give you more than four times the server resources of a shared host, plus the speeds are twice as fast. You’ll also get access to a performance dashboard within cPanel, for an improved website and server monitoring. If you run a WordPress site, then you’re probably looking for a host that’ll help you get the most out of your site. When your site is small, you can probably get away with using a standard shared hosting plan. Incredibly fast speeds that are 2.5 times faster than shared hosting. A scalable cloud hosting backend for high levels of reliability and easy scalability. Very easy website, email, file, and database management through the included portal. Robust security features, including daily malware and spyware scans, WordPress-specific security features, and automated backups if you require a website restore. A dedicated 24/7 support team with real-time phone support. The Starter Plan is perfect if you’re only running a single WordPress site that gets a decent volume of traffic. It can easily support WordPress sites that get up to 25,000 visitors per month. Not only that but you’ll get up to 1GB of storage space for website backups alone, along with 50GB of storage for your website files. If you’ve got a decent sized WordPress blog and are only planning on creating a single site, then this plan could be a great choice. The Standard Plan is probably the most popular WordPress hosting plan they offer. It’s only a bit more expensive, plus you’ll get the ability to host two WordPress sites and support traffic levels of up to 200K visitors per month. If your site is growing like crazy, or you’re currently running two different WordPress sites, then this is a great plan to check out. The final WordPress hosting plan is the Business Plan. This plan is great if you’re operating three entirely different WordPress websites. Plus, you’ll have support for traffic levels up to 300k monthly visitors. In terms of website backups, you’ll have space for storing up to 3GB of website files. Plus, you’ll have unlimited storage overall for your website’s files and content. This can be very useful if your websites are quite large. VPS hosting is a great hosting choice for those who’ve outgrown shared hosting but aren’t quite ready to upgrade to a dedicated server just yet. VPS hosting utilizes server virtualization technology to essentially create a dedicated server environment, while still keeping costs very low. VPS hosting is a great choice if you need to support higher or scaling traffic levels, but you don’t want to invest in the higher monthly fees that come with a dedicated server. VPS hosting also gives you very fast performance, upgraded storage, and security, plus the ability to quickly scale your hosting resources. This can be invaluable if your site’s traffic levels continue to grow. The Snappy 2000 plan is equipped with 2GB of RAM, 2 Cores CPU, 120GB disk space, and 1.5TB bandwidth. Plus, you get full root server access, weekly offsite backups, multiple layers of security, along with website development tools, thousands of website templates, a script installer, and a lot more. The Snappy 4000 plan is equipped with 4GB of RAM, 2 Cores CPU, 165GB disk space, and 2TB bandwidth. Plus, you’ll get access to all the same features as the Snappy 2000 plan. The Snappy 8000 plan is equipped with 8GB of RAM, 4 Cores CPU, 240GB disk space, and 3TB bandwidth. Plus, you’ll get access to all of the features included in the Snappy 4000 plan. Dedicated server hosting is one of the most expensive forms of hosting across the board. But, with the higher monthly fees, you get access to an entire physical server to do whatever you wish. This style of hosting is definitely more in niche in nature, as most websites won’t grow large enough to actually need their own dedicated server. But, if your site is large enough (and you have the technical resources to support and maintain a dedicated server), then this style of hosting provides a ton of benefits. For example, you’ll get extremely fast performance, very high levels of security, near endless server customization, and a crazy amount of storage. HostGator is well known for its reliable and high-performing dedicated server plans. Plus, you have the ability to choose either Linux or Windows operating systems for your server. Not only that, but you can manage your server environment with the intuitive cPanel web application. You also have the option of choosing between a fully managed and semi managed hosting environment. The Value Server plan provides you with a 4 Core 8 Thread Intel Xeon-D CPU, 8GB of RAM, 1TB HDD, unmetered bandwidth, along with the choice of Linux or Windows operating systems. You also get state of the art DDOS protection, an IP-based firewall, 24/7/365 server monitoring, and advanced server management tools. This plan starts at $119.00 per month. The Power Server plan provides you with a 8 Core 16 Thread Intel Xeon-D CPU, 16GB of RAM, 2TB HDD or a 512GB SSD, unmetered bandwidth, along with the choice of Linux or Windows operating systems. You also get access to everything in the Value server plan. The plan is available from $138.99 per month. The Enterprise Server plan provides you with a 8 Core 16 Thread Intel Xeon-D CPU, 16GB of RAM, 2TB HDD or 512GB SSD, unmetered bandwidth, along with the choice of Linux or Windows operating systems. You also get access to everything in the Power server plan. This plan starts at $139.00 per month. The hosting plans highlighted above are their most popular offerings. However, there are additional hosting types that you might find of value. For example, if you’re a web developer who creates and manages client websites, then you might want to be able to offer hosting as a service. Same goes for any other freelancers or agencies in the technology space. Reseller hosting can be a great way to offer hosting as an add on service. Reseller plans are designed in a way that’ll help you earn money and seem as if you’re a legitimate hosting company. All without having to physically manage any servers. If you’re already using HostGator to host your own site, then it just makes sense to offer HostGator Reseller hosting to your clients as well. Aluminum. This plan is equipped with 60 GB of disk space, 600GB bandwidth, support for unlimited domain names, and free SSL. This plan starts at $19.95/mo. Copper. This plan is equipped with 90GB of disk space, 900GB bandwidth, support for unlimited domain names, and free SSL. This plan starts at $24.95/mo. Silver. This plan is equipped with 140GB of disk space, 1400GB bandwidth, support for unlimited domain names, and free SSL. This plan starts also starts at $24.95/mo. Overall, the reseller plan you choose will be based upon how many different websites you need to host, and the overall size of the sites you’re hosting. If your reseller hosting needs continue to grow, then you can always upgrade to a higher level plan. HostGator offers dozens of different applications you can install on your server. The most popular is probably WordPress, but you’ll find tons of other useful applications as well. Plus, all of the offered applications come with a one-click install. Just select your application of choice and let the bundled software quickly install your application of choice. WordPress. With the WordPress CMS, you can quickly and easily create simple blogs, to massive content sites. Joomla. Joomla is another very popular CMS that can be customized to your liking. You’ll also find a variety of plugins available for quick website customizations. Drupal. Drupal is another commonly used CMS that gives you a high level of customization and control over your site. You’ll also find dozens of different themes and plugins you can choose from. Magento. Magento is a powerful eCommerce store software. With this plan, you’ll get everything you need to create your very own eCommerce store. Wiki. This application lets you create a site that’s similar to Wikipedia. It’s equipped with a variety of different wiki software to choose from. phpBB. This open source forum software will help you create your very own forum, and customize it however you see fit. If you require a Windows hosting setup, then HostGator has you covered. Linux is typically the most preferred OS when it comes to hosting, some website owners will need Windows for their sites to work properly. HostGator Windows hosting packages are equipped with the Parallels Plesk Panel, Microsoft SQL Server 2008 R2, and IIS (Internet Information Services). Plus, you’ll find a ton of other Windows-specific hosting services that’ll help you get the most out of your server environment and website. The Personal plan starts at $4.76 per month, while the Enterprise plan starts at $14.36 per month. No matter what hosting plan you’re looking at you’re going to find it packed with features. Below you’ll find a breakdown of the most common features that HostGator offers. Some will be stock features of a hosting plan you select, while others are add-on tools and features. As you’ve seen so far, HostGator offers a variety of hosting plans that’ll cater to virtually every single kind of website owner. This means that no matter how large your site becomes, or the type of site you’re building, you’ll be supported every step of the way. The most popular offering is their shared hosting service and knows what customers at this level are looking for. Plus, with plans like VPS, cloud, and even WordPress-specific hosting, you can easily scale up to a different service as your site grows. When you sign up for a HostGator hosting plan you get a lot more than just a server to store your site’s files. For example, you’ll get hosting features like unlimited storage and bandwidth, access to an intuitive website builder, free website migration, and more. Not to mention access to hundreds of different applications you can install on your site like WordPress, Joomla, Drupal, and more. Plus, you get $100 free Google Adwords credit you can use to market your site when you sign up for a hosting account. No matter which hosting package you choose you’ll get a 45-day money back guarantee. If you’re on the fence about using this service, then this guarantee will give you plenty of time to test out the service. However, to get your refund you must stay in alignment with the terms of service. The other great guarantee is the 99.9% uptime guarantee. This means that your site will be online 99.9% of the time. Usually, the only time your site will be offline is if it’s undergoing routine maintenance. If you need perfect time, then consider upgrading to one of the more expensive hosting packages. With almost every HostGator hosting plan you’ll get access to get access to the intuitive and powerful cPanel software. This makes it very easy to manage your site and server environment. For those using Windows, you’ll get access to the Plesk control panel. This will help assist with tasks like email and website management, server configuration, and software installation. HostGator has a wide variety of security features that’ll help protect your server environment and keep your website safe. HostGator servers are protected by very strong custom firewalls to help protect against a wide range of attacks, including DDoS attacks. Plus, there are physical datacenter security protocols in place to secure the server facility. When you sign up for a hosting account you’ll automatically have regular malware and security scans. The free scan won’t scan your entire website and won’t offer you a way to remove any viruses or infections, but it’ll give you a report and notification, so you can take further action. If you’d like to upgrade the frequency and depth of the regular security scans, then you can opt to add a higher version of SiteLock to your account. When you create a HostGator account you’ll also create your own security PIN. This will be used to verify your identity anytime you contact support. This will help to ensure that your account doesn’t fall into the wrong hands, and no one can make account requests without your permission. 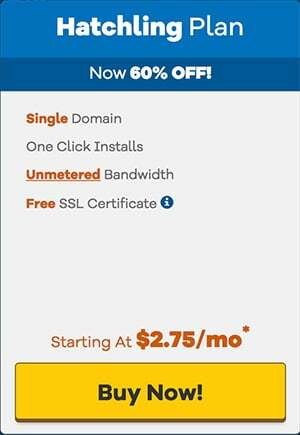 Every HostGator plan is equipped with an SSL certificate. By having an SSL certificate installed on your site any traffic that passes between the website and server will be encrypted. If you need a higher level SSL certificate, then you can either upgrade your hosting plan or upgrade the SSL certificate during checkout. Beyond everything highlighted above you’ll find a handful of great tools and services that’ll help you build out your site and get it online. With most plans, you’ll be able to use the HostGator website builder free of charge. Those who want access to even more design features and functions can sign up for a higher level plan. The website builder is incredibly easy to use and will let you build a website incredibly quickly. It’s equipped with over 100 different mobile-friendly templates that you can edit with the drag and drop builder. It also comes with pre-built website sections that you can choose from to speed up the design process. Far from being just a hosting company, HostGator can also serve as your domain name registrar. After all, you need both a web host and a domain name, if you want a live website on the internet. Once you head over to the Domains page, you can input your domain name using the search tool to see if it’s available. You can even transfer your domain name over to Hostgator too if you’ve been using a different domain name registrar. Automatic domain name renewal. With automatic domain name renewal, you’ll never forget to renew your domain again. Easy domain name management. With the intuitive cPanel, you can quickly and easily manage all aspects of your domain name. Domain locking features. This feature once enabled, will help prevent accidentally losing your domain name. Or, having it lapse and being purchased by another party. There are a variety of premium add-ons that you can add to your hosting package during sign-up, or add at a later date. Some are services, while others are software that will protect your site, like CodeGuard and SiteLock. CodeGuard is a backup add-on for your hosting plan. It provides your site with automatic backups, along with regular website monitoring and alerts if any unwanted changes are made. There’s also the option to easily restore your site from a previous backup, if the need arises. SiteLock is a website monitoring service that’ll protect your website from hackers. You can purchase this as an add-on to your hosting package. You’ll also get alerts if your website has been compromised, as well as assistance for fixing and elevating the security of your site. If you want to hire a professional to design your site, then why not use the HostGator team. They have a staff of website design professionals that’ll provide you with a high-quality website template, along with a few pages of content to get you started. Your website will also be built on the WordPress framework, so you’ll be able to customize and grow your site for years to come. By having an SEO strategy in place you can help your site rank in the search engines. If you want to get started on the right foot, then you can actually contact their team for a free SEO consultation. If you decide to move forward, then they’ll help you execute on a strategy that includes , on-site optimization, keyword research, and content creation. If you’re looking to increase sales with paid advertising, then consider their Pay-Per-Click advertising service. If you have money to invest in your site, then this is a great place to start. By working with their team they’ll help to create a keyword list of different keywords you’ll target throughout your advertising campaigns. Plus, they’ll even manage your campaigns, help to create ads, along with doing what they can to boost the success of your ads. Yes, HostGator makes a point to make sure their service is very intuitive. Everything from signing up for a hosting plan, adding a domain name, installing a CMS, or using the site builder, is all incredibly simple. If you’ve never built a website before you’ll be able to quickly grasp everything you need to do. Plus, there’s a wealth of tutorials if you ever get stuck. Not typically. However, sometimes you might find a promotion they’re running that gives you a free domain name when you sign up for hosting. There is the ability to add a domain to your purchase whenever you sign up for hosting, which does simplify the process of getting your site online. Does HostGator offer a money back guarantee? Yes, it currently offers a 45-day money back guarantee. As long as you stay within the terms of service you’re eligible for the refund. This refund period is actually one of the longer guarantee periods offered by a hosting company. Usually, you’ll find refund periods that are a maximum of 30 days. Will Hostgator migrate my site for free? Yes. If you’re switching over to HostGator as a hosting provider, then they’ll migrate your site entirely for free. This is a great feature as it’s entirely hands-off. So, if the thought of all the technical steps of a site migration overwhelm you, then you don’t have to worry. HostGator has your back. SSL is quickly becoming a requirement. 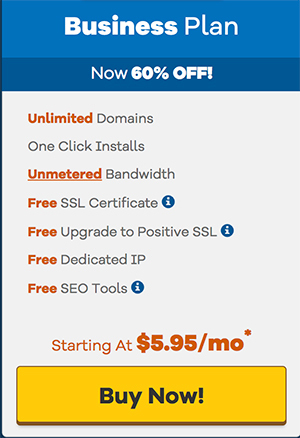 When you sign up for a HostGator hosting plan you’ll automatically get a free SSL certificate. The level of SSL certificate will differ depending on the plan you purchase. Yes, you can backup your site via cPanel whenever you wish. However, the scope of these backups are limited. If you’re serious about backing up your site it’s a good idea to use a third-party service, or try out Codeguard. HostGator offers a variety of different hosting types, packages, and tools to suit virtually every kind of website owner. No matter your existing skills, budget, or requirements. Plus, with it’s top-notch support, reliability, and focus on security you can count on Hostgator when you need them the most. Now, no host is perfect, and HostGator isn’t without its drawbacks. But, HostGator tends to get the valuable and necessary features right. Which is probably why it continues to be one of the most popular hosting companies in the world. Are you currently using HostGator to host your website? What features are your favorite, and what drawbacks have you come across? Please share your experiences in the comments below! Want to leave your own review about Hostgator? If it provides value to our visitors then we will publish and send you $30. Note that not all reviews will be published. To be in with a good chance of your review getting published then you will need to write valid, unique, resourceful and helpful reviews – this can be either positive or negative. All the best with your review!! !